Nyctaginaceae, the four o'clock family, is a family of around 33 genera and 290 species of flowering plants, widely distributed in tropical and subtropical regions, with a few representatives in temperate regions. The family has a unique fruit type, called an "anthocarp", and many genera have extremely large (>100 µm) pollen grains. The family has been almost universally recognized by plant taxonomists. The APG II system (2003; unchanged from the APG system of 1998), assigns it to the order Caryophyllales in the clade core eudicots. A phylogenetic study by Levin has justified the combination of Selinocarpus and Ammocodon into the genus Acleisanthes. The genus Izabalea is now considered a synonym of Agonandra, a genus in Opiliaceae. A more recent study by Douglas and Manos clarified the relationships among almost all of the genera in the family and demonstrated that a substantial diversification of herbaceous genera has occurred in arid North America. Many genera of Nyctaginaceae possess unusual characters. Notable examples include sticky bands on the stems between the nodes, cleistogamous flowers (which self-pollinate without opening), or gypsophily, the ability to grow on soils with a high concentration of gypsum. 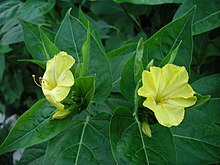 The family contains one food crop, the mauka (Mirabilis extensa), a root vegetable of minor local importance in the Andes. Garden Four-O'Clocks Mirabilis jalapa species are grown as ornamental plants, as are species of Bougainvillea (Bougainvillea glabra, B. spectabilis, and numerous hybrids), Bougainvillea and Abronia are commonly cultivated in warmer regions. ^ Angiosperm Phylogeny Group (2009). "An update of the Angiosperm Phylogeny Group classification for the orders and families of flowering plants: APG III" (PDF). Botanical Journal of the Linnean Society. 161 (2): 105–121. doi:10.1111/j.1095-8339.2009.00996.x. Retrieved 2013-07-06. ^ "Family: Nyctaginaceae Juss., nom. cons". Germplasm Resources Information Network. United States Department of Agriculture. 2003-01-17. Retrieved 2010-10-18. ^ "GRIN Genera of Nyctaginaceae tribe Boldoeae". Germplasm Resources Information Network. United States Department of Agriculture. Retrieved 2010-10-18. ^ "GRIN Genera of Nyctaginaceae tribe Bougainvilleeae". Germplasm Resources Information Network. United States Department of Agriculture. Retrieved 2010-10-18. ^ "GRIN Genera of Nyctaginaceae tribe Caribeeae". Germplasm Resources Information Network. United States Department of Agriculture. Retrieved 2010-10-18. ^ "GRIN Genera of Nyctaginaceae tribe Colignonieae". Germplasm Resources Information Network. United States Department of Agriculture. Retrieved 2010-10-18. ^ "GRIN Genera of Nyctaginaceae tribe Nyctagineae". Germplasm Resources Information Network. United States Department of Agriculture. Retrieved 2010-10-18. ^ "GRIN Genera of Nyctaginaceae tribe Leucastereae". Germplasm Resources Information Network. United States Department of Agriculture. Retrieved 2010-10-18. ^ "GRIN Genera of Nyctaginaceae tribe Pisonieae". Germplasm Resources Information Network. United States Department of Agriculture. Retrieved 2010-10-18. Douglas, NA and Manos, PS. 2007. Molecular phylogeny of Nyctaginaceae: taxonomy, biogeography, and characters associated with a radiation of xerophytic genera in North America. American Journal of Botany 94(5) 856-872. Wikimedia Commons has media related to Nyctaginaceae. Nyctaginaceae in L. Watson and M. J. Dallwitz (1992 onwards), The families of flowering plants. This page was last edited on 20 February 2019, at 19:41 (UTC).